A journey back in time around Cullercoats through the eyes of famous artists. Why Cullercoats, a small and perhaps unassuming fishing village became such a popular place for artists could be debated ad infinitum. 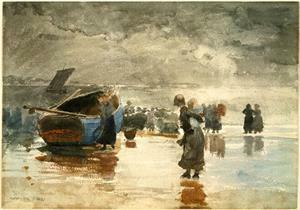 Winslow Homer, one of America's leading artists, certainly found reason to stay in Cullercoats in that he spent a number of months living and painting here. Perhaps the rugged coastline and the more often than not bracing sea breeze reminded him of his native New England. Maybe the fishing folk, their way of life and character inspired Homer and other artists to use them as subjects for their creativity. The quaint charm of the village and the picturesque harbour that is Cullercoats Bay are also reason enough to inspire. To this day contemporary artists, inspired by their brethren from days gone by, continue to paint scenes in and around Cullercoats. 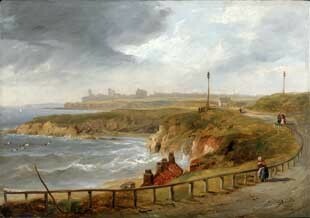 Cullercoats was known as an artist's colony and had a reputation among artists as being an inspiring place to both live and work. The origins of the colony date back to the 1820s when Newcastle artists including John Wilson Carmichael discovered the appeal and charm of Cullercoats. The breath-taking coastline and the character of the fishermen and fishwives soon became a favourite subject of artists throughout the 1800s. The likes of Robert Jobling, John Falconar Slater and William Henry Charlton are all famous names associated with the Cullercoats artist's colony. The seafront landscape may have changed over the course of time but the desire to paint, sketch and draw Cullercoats remains very much alive. Modern day contemporary artists draw inspiration from the stunning coastal scenery of today and the works of their predecessors from yesteryear. A detailed copy of the trail can be printed out by clicking on the website link.